Welcome to the best bitcoin trading guide on the internet. We have a complete table of contents below that you can use to navigate the rich content available to help you learn the ins and outs of trading bitcoin futures. Note that sites sometimes use slightly different systems, and where it is relevant it will be noted in this guide. If you are looking for specific exchange walkthroughs, see the menu on the left to for BitMEX, CryptoFacilities, Bitfinex, and WhaleClub. There you can find full screenshot and step by step explanations of the key features specific to each place. Here you will learn more broad concepts regarding daytrading bitcoin and futures in general. Even if you are not an active trader, there's a lot to learn about markets and how they're structured in this guide. Some of the early sections may be a little too easy for those of you who already are traders, so just navigate through to the part that is most relevant to you if you want to hit a more advanced topic in the guide. Note: This guide will NOT teach you strategies for how to analyze price to figure out how to profit. It is a technical guide of how to trade bitcoin futures and understand what you are trading. You can't profit until you know how to actually execute and make the money! The most important feature of futures is that you never have to sell bitcoin ever again. Seriously. Why would you sell into fiat when you are concerned about a possible price drop? If you want to short bitcoin, then with futures you can simply "sell" or "short" the derivatives contracts and earn more bitcoin when the price drops -- so that your fiat value is the same or more if you use leverage. Of course you can also buy the contracts and multiply your bitcoin when the bitcoin price goes up! But think for a moment how important this tool is: earn more bitcoin when the bitcoin price drops, and you effectively do NOT have to sell to fiat anymore. And with the power of margin leverage, you don't have to risk too much Bitcoin to take meaningful directional positions. If the price drops to $500, you earn 11.73 BTC on the position and have 20.06 BTC left, which at $500 per BTC is worth $10,000! This is a simple example just to show you, even if you're a small bitcoin holder, bitcoin futures are a valuable risk management tool. You could have performed this "hedge" at 50x leverage by putting down just 8.33/50= 0.17 BTC worth of margin! First you need to learn what futures are and the absolute basics. Futures in general are counterparty contracts. This means that the contract value comes into existence when two people agreeing to enter into it. The exchange is not your counterparty, the contracts are created when new limit orders in the orderbook are filled. Futures contracts derive their value from an asset and more or less follow the movements of the underlying commodity, in our case: bitcoin. They ultimately settle at price of the commodity in the future on a particular exchange, or an index that represents a basket of prices at different exchanges. So if you have a weekly future's contract and you don't want to sell out of it on the market, then it will expire at the price at a specific time when Friday comes and if you want to maintain your position you must re-open on the new contract period. In the weekly example, if a contract is issued at April 14, 2017, it dies on April 21, 2017. If you buy the contract at a price of $1,100 and you don't sell it for the whole week, and the price ends on April 21 at $1,200, then you profit. When you hear "margin", you may be thinking that you are borrowing money to trade bitcoin futures. This is not quite true. A key feature of these futures contracts is that the leverage comes from counterparties providing it to one another, not from the exchange lending funds and not from any bitcoin being lent from third parties. The contracts are simply like stocks with a market price, which represents the agreements between traders to take the opposing sides of where price of bitcoin will go, so no actual bitcoins are being exchanged per se, however the profit and loss between counterparties is very real! Exchanges simply take a fee to facilitate the orderbook where its clients (the counterparties) create and trade futures contract with each other. They also have to manage the system's risk so that traders don't get overleveraged or manipulate the market. Since counterparties are only putting margin down that is a % of the contract value, the exchange also has to handle liquidation procedures in case the value of the margin is exceeded by the loss on the notional market value of the contract. For instance, BitMEX offers 100x leverage, so if you want to enter a $10,000 position you need to put down $100 worth of bitcoin. If the price moves just 0.5% against your favor, BitMEX will take over your position and execute it into the market, so that the person on the other side of the contract can have someone else who pays for the profit. In the event that the liquidation doesn't get passed off to another trader, an Auto-Deleveraging/Termination can occur, or Socialize Loss in the contract builds (we will discuss these issues in more detail later). Here's some key terms to highlight the anatomy of a futures contract in bitcoin, using slight differences between BitMEX's and CryptoFacilities' systems. Remember that each futures exchange is different and make sure to visit the Exchange Walkthroughs to understand the exact nuances of how the contracts are priced. Expiration - what Date and Time does the contract expire and settle on the Index price? Index Price - upon contract expiration, the value it settles on is this index, which is a weighted representation of the bitcoin spot price. Mark Price - this is the price that profit and loss of positions is marked to, and is used to trigger liquidations and margin calls. Notional Value - this is the BTC value of the contract. Most bitcoin futures are inverse and denominated in USD. This means a contract whose value is $100 has a different BTC value depending on the current price in the market. If the spot price of bitcoin is $1,200 then a $100 contract has a notional value of 0.0833 BTC. Initial Margin - the amount of bitcoin you have to put down in order to trade a certain amount. This determines your leverage. So if it's 20%, then you put 0.2 BTC down to trade 1BTC worth of contracts, this is 5x leverage. Liquidation Margin - this is the % of the position value you must stay above to avoid total liquidation. This is how CryptoFacilities and many other traditional exchanges divide up their risk management. This will always be a lower % than Maintenance Margin. 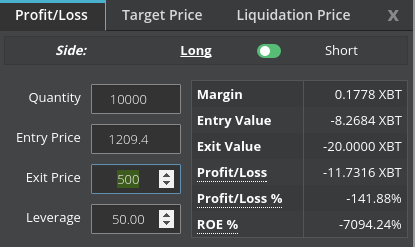 Termination Margin - this is the % of the position value you must stay above to avoid total liquidation It will always be less than the liquidation margin %. This is greater than zero in order to compensate the contract holder who is forced out of position due to illiquidity. Margin Call - when you run out of bitcoin on your account to cover the contract positions you have taken (your account value doesn't cover the Maintance Margin) you are officially rekt. Some exchanges like CryptoFacilities will merely notify you that you have to deposit more or reduce your positions to increase your margin. Others like BitMEX will liquidate you at this level where the exchange takes over your position to liquidate it into the market to prevent system loss. If this sounds confusing to you, then don't worry. In practice, these futures contracts are just like buying and selling spot market value. Just focus on the price of the contract and whether you are LONG or SHORT. If you're long and the futures price goes up, the BTC value of the contract goes up and you have bought an asset that is increasing in value. Example: If the futures contract price is $400, then you can buy 0.5btc worth of this and if the price of bitcoin goes up to $450 the futures contract price will go up, and the value increases from 0.5 BTC and you can just sell for a profit. Trading a synthetic derivative rather than spot bitcoin allows you to use margin leverage to more easily buy and sell -- the contracts are just a facilitation of the value. ​Trading these futures instead of actual bitcoins is smart because you are able to access higher leverage by entering contracts with counterparties, while keeping your coins safe in cold storage or elsewhere. Additionally, unlike trading margin on Kraken or Bitfinex, you do NOT have to pay interest on the leverage you have! This is the result of the counterparty structure of futures. High leverage trading, low-fees, and high profit potential. Can I sell a futures contract without actually owning it? How Does That work? Yes you can. Note that every futures contract has a LONG leg and a SHORT leg which balance each other out. Every bitcoin futures contract has two counterparties which each take one leg of the trade. This means by definition there are as many longs as shorts in the bitcoin futures markets. Even though you don't actually own the contract you can "sell" it or take the "short" side of the contract just by setting the margin down in bitcoin and completing the order. This does NOT mean that you receive instant money for selling the contract. Quite the opposite, it costs you the initial margin required in order to enter the contract. Assume there is 0 contracts open and 2 traders, and a new futures contract expiring in 7 days opens. You can "create" a contract by putting a limit sell order in the orderbook at a given price. If someone market buys that limit order, an open contract is created between you and the other trader. This is how you can go from a position of 0 to a negative exposure just by selling a contract. You may wonder: where do these contracts come from? We know on the spot market that bitcoins are being bought and sold for fiat, but how the heck are bitcoins being used to trade bitcoin futures contracts? Let's walk through a really simple example showing how an exchange functions when there's just a simple two traders who want to go long and short. Assume it is January 3, 2015. Bob and Ann both want to trade at Bitcoin Futures Exchange (BFE). BFE offers 3 different contracts: one expiring and settling on Friday January 9 ('weekly'), another expiring Friday January 16th ('biweekly'), and finally one expiring in March 27 ('quarterly'). Each contract is worth 1 bitcoin notionally. 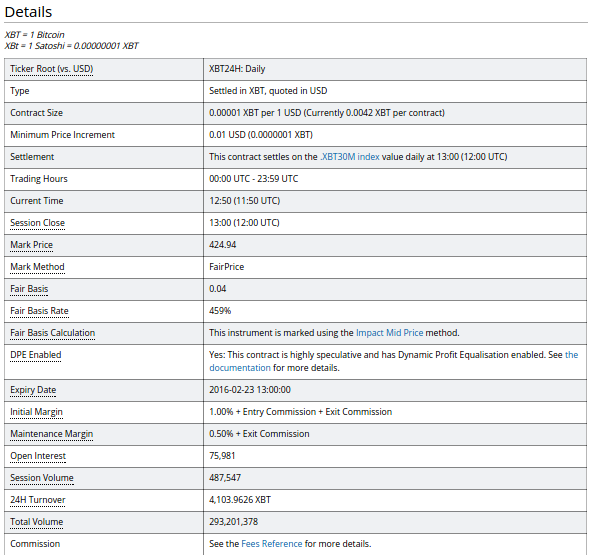 BFE has a policy that traders have to put 20% of margin down to enter a trade, so Bob and Ann deposit 0.2btc to their BFE accounts as they only want to trade 1 contract. Bob's transaction confirms first so he goes on BFE and looks at the contract selections. He wants to trade on the January 9 expiration contract. 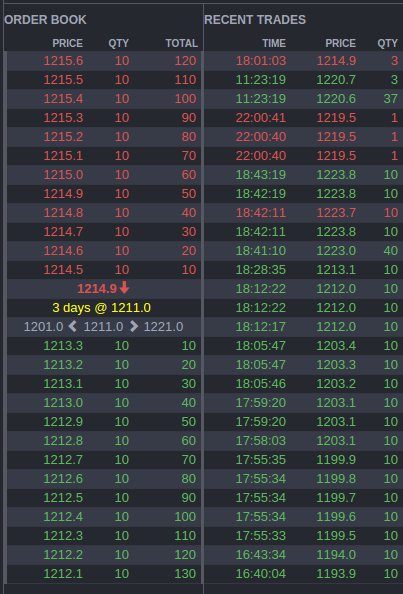 The orderbook is empty and Bob wants to go long (profit off an increase in bitcoin). Since there are no offers available, he places a limit order in the orderbook for a bid at 400 of 1 contract, using his 0.2btc as collateral for the position. Ann then goes on BFE and she wants to short on bitcoin at market price. She sees that only the January 9 contract has any orders. She could put a limit order in the orderbook if she wanted. However, she sees Bob's bid in the orderbook and decides to fill it, and uses her 0.2btc as margin to collateralize this position. She has just opened a position worth 1 bitcoin that has 5x leverage, and so has Bob. Now there is an open interest in the futures contract created. The simple act of two traders with no open interest, one making a limit order which then gets filled by the other, is what creates this position. The exchange then holds the 0.2 BTC margin of each party and the Profit and Loss (PNL) of the contract seesaws between counterparties based on market movements. If the exchange is liquid and rational, then the market price of the contract will change as the spot market moves. So if bitcoin price starts going up, futures traders will bid the price up. Traders do NOT need to wait until settlement in order to get out of position and profit from the trade. Bob or Ann can pass off their side of the future contract to someone else. So Bob, who is long, can sell the contract at a different price to Sally, who wants to hold the long side of the contract where Ann is short. So if Sally puts a bid order in the January 9 futures orderbook at $410, then Bob can sell his contract to Sally, earning a nice 2.5% return nominally, or 12.5% (5x) return on the 0.2 BTC initial margin used. In this sense, the contracts are just like trading spot! Now let's say that both traders simply hold the January 9 contract to expiration. If price settles at 440, 10% higher, then Bob will get a 50% return on his initial margin (+0.1btc, 5x leverage enhances his 10% gain on the notional 1 bitcoin of the contract) and Ann will lose 50%. (-0.1btc). This is one of the most powerful parts of futures: higher leverage means higher returns on your trades. The leverage feature is essential for hedgers and speculators trying to get the most out of their capital when managing risk. And better yet: you don't pay daily interest or any margin fees on this leverage with bitcoin futures! You will then be able to trade futures contracts just like they are bitcoin spot. If price goes up on spot, a good futures exchange will have its contracts also going up in price, and then you can sell and get out. However, the price of the futures contract is dependent on others trading it. So if nobody else is trading it and bringing the market price of the contract along with changes in the underlying asset, then it's useless and you are forced to hold it until settlement to realize any of the profit/loss from the position. That's why liquidity and volume are essential to a quality exchange. If you enter that contract at $400 and you see bitcoin spot price jumping to $500 but nobody is trading futures so you can't sell it to them, you get screwed. Luckily at this point in 2016 there are numerous options for trading futures that are liquid and settle on short time horizons. So you can typically trade contracts and get in and out of them with decent spreads and reasonable fees. Speculating and hedging bitcoin with futures has never been easier. Spot has lower leverage which means you have to risk more of your capital with exchanges. Margin fees are very expensive on Bitfinex and Kraken when you are borrowing funds and paying up to 0.1% per day to be in a position. Futures contracts on the other hand have no holding fees associated. You pay a fee to enter the contract, and you pay a fee to exit the contract. Your profit or loss comes from the change in the price you pay. So really futures are no different than buying anything else at price X and selling it for X+1 or shorting at X and covering at X-1. If you don't want to get caught up in the technical side of how the contracts work, you can just simplify it by thinking about it as buying and selling anything else. The contracts do expire and guarantee that they close at a future price, and this characteristic makes for the useful risk management tools available. Futures price is not always equal to spot price. Most exchanges use multiple spot exchanges in an "index". Since there is a period of time between now (t=0) and when a given futures contract expires (for example t=7 days), then there's always uncertainty between the current price and what it will be 7 days from now. In pure financial theory, the value of a futures contract is based on a "no arbitrage condition" from the interest rates in each asset. We have Bitcoin and US Dollar. Bitcoin interest rates tend to be less than US Dollar interest rates, so when you want to replicate the future value of bitcoin in US dollars, you have to borrow USD at, say, 5%, and invest in Bitcoin at 1% return. This requires a premium on the futures exchange to be able to hedge that trade. You can use our Futures and Forward Fair Value calculator to compute a reasonable market value for a contract given a USD rate and BTC interest rate. However, it is important to note, that Bitcoin Futures often trade in high premium, or a discount, which reflects the market sentiment of what the future price will be. In the end, it's always the market that decides the price and value of these financial assets. ​The price of the futures contract can deviate from the underlying price of bitcoin on spot markets, which can vary based on sentiment. But in the end, at expiration of the contract, the contract MUST settle at the price of spot. So you need to watch the main spot market price movements because the futures contracts will track the movements underlying (sometimes leading, sometimes lagging, sometimes simultaneously). There are three Chinese exchanges worth following: OKCoin, Houbi, and BTCC; there are two Western exchanges worth following: Bitfinex and Bitstamp. Other exchanges that are currently less important but still worth keeping an eye on are: ItBit, Coinbase, OKCoin USD, BTC-e, and Kraken (which has the largest BTC/EUR orderbook as of December 2015). You can use other charting sites too, to get a feel for what tools and resources are available that Bitcon traders use. Easy overview of the key features of different exchanges. Be Long & Short Same Time on Same Contract? The key to great profit is leverage. This means simply that you put down 1 bitcoin and you can trade 20 on OKCoin, or 100 bitcoin on BitMEX. The multiple refers to the initial margin you need to open the nominal position value. You simply set the margin aside as collateral, and if the position goes against you, the collateral will be used to exit your position into a liquidation, or margin call. It bears repeating -- when trading futures on leverage, you are not "borrowing" the money, so you don't have to pay a financing rate on your positions. Even though you are 100x exposed, you don't have to pay 100x financing (unless you're trading the perpetual swap, which is not a futures contract, but has similar characteristics). 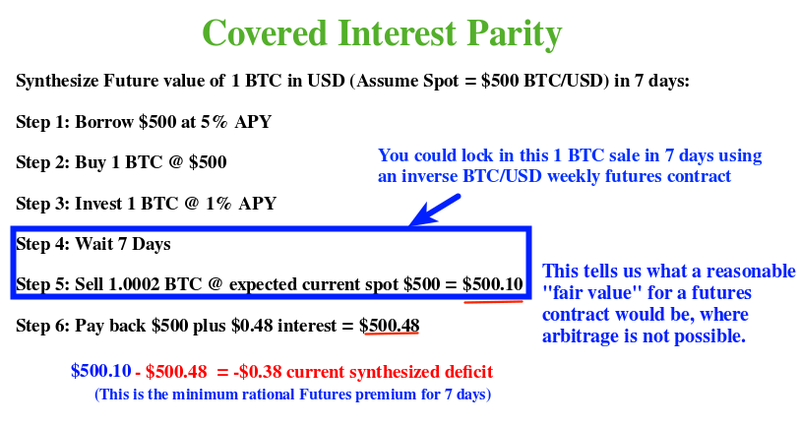 Since bitcoin futures do tend to trade at a premium, you are in a way paying an implied interest rate in the contract, because if you want to go long, you have to pay above spot, so you pay the interest up front in the contract, in a way. Margin-trading is what provides the real reward and potential in daytrading bitcoin. You will be able to access the leverage to profit well from relatively small moves in BTC/USD price. High risk, high reward, high potential for loss. However, you need not use Futures only to speculate, hedging on lower leverage is also a great use case for Bitcoin derivatives if you just want to defend your coins. Futures are traded between customers using the orderbook, the exchanges are merely facilitating the trades, not taking the other sides of positions. To learn the difference between orderbook exchanges and CFDs or "bucket shops", read this post. Basically, if you trade margin spot on a site like Kraken or Bitfinex, you will pay financing fees while you hold the position open. The same goes for CFD sites like WhaleClub or 1Broker. With bitcoin futures, you are able to trade margin without expending interest, because counterparties to the contract pay a fee to open and close the contract, and the exchange just manages the risk, so no money is really being lent! Should I trade with fixed margin or cross margin? Fixed margin will isolate your margin to the individual position you have made in an instrument. So if you have 1 bitcoin in your account and you put 0.2btc margin for a Weeklies Futures long position, and it gets margin-called, you still have the 0.8btc left. However, if you're on cross-margin, also known as portfolio value margin, then your whole balance on the site is going to be used to back all your positions, and if you get margincalled, it's because you have run out of money on your whole account. If you are new use Fixed Margin. Cross Margin can be very beneficial for swing traders who need to ride out turbulent, choppy price action, but new traders should NOT risk their whole account. So on BitMEX you want to isolate margin, and on OKCoin you want to use fixed margin, not cross-margin. To experienced traders: do your thing. Cross-margin will keep you from getting chopped out on moves and there are many legitimate benefits. Start small. Get familiar with the platform you're using before you make any significant trades. BitMEX offers a sandbox using Testnet coins. OKCoin and BitVC do not offer a demo version, but you can start small with 1 contract and test how Open Long, Open Short, Close Long, Close Short and different order types work. If you contact CryptoFacilities you can also get access to a demo platform to use. When you are getting started making actual trades, in general you should focus on making LIMIT ORDERS which will get FILLED by other traders. Not only will you pay lower fees this way, but you will also be making more composed trading setups because you aren't impatiently just market-buying or market-selling into the spread. So a general principle you should follow is to AVOID MARKET ORDERS WHEN YOU CAN! You will pay higher "taker" fees and you will be at the mercy of the spread which is a hidden fee. With BitVC and OKCoin you can hold simultaneous long and short positions on the same contract. In BitMEX you can not. Technically it makes no sense to hold opposite simultaneous positions because it just cancels each other out. You may as well just close the position instead. There are some who still prefer, for psychological reasons, to use this and wrongly call it a "hedge", but really you're better off saving the trading fees and just getting out of a position if your outlook on a trade has changed. At the expiration of the contract you are trading, all positions get closed out and settled. Different exchanges use different anchors to settle against. To avoid manipulation, most of them use an index. OKCoin uses a custom 6-exchange index (3 chinese, 3 Western), while BitMEX, Deribit, Coinpit, and CryptoFacilities use a multi-spot-exchange Index to settle all of its contracts at expiration. This minimizes the risk of any manipulation if contracts settled on a single exchange's price, but it also makes it more difficult to manage your hedges since there's no way to "buy" or "sell" an index. No system is perfect, and each one offers different unique pro's and con's, just like your selection of contract type and length. So depending on your case you may want something different than someone else. Don't worry, your profits are not stuck until the contract expires, every exchange has a settlement procedure that makes your profits available for withdrawal either daily or weekly. CryptoFacilities, Coinpit, and BitMEX has a realtime profit realisation, while OKCoin and Deribit has weekly rebalancing scheduled for all contract lengths. It's important to note that on all of these exchanges, all the futures and forwards are non-deliverable and have expiration at various times. Despite this, OKCoin uses "delivery" as their term for expiration settlement of a contract, and "settlement" for the weekly rebalancing of the Pnl for higher length contracts. Since we are stuck with this unprofessional Chinese exchange being the dominant market player in futures, we have to focus on their use of the terminology, but BitMEX and CryptoFacilities have very impressive and professional setups that use well documented procedures. Always read the documentation of any exchange you're using and the contract specifications of the individual product you're using. So their weekly contract is settled every Friday, at which point the BiWeeklies and Quarterlies are rebalanced to allow any profit to be withdrawn even though the expiration settlement is a week or many weeks later. As an example: if you have Quarterlies contracts that you made profits on over the weekend, then this profit needs to be withheld because of the risk of socialised losses. By Friday, however, this profit is available to be withdrawn and the positions are all rebalanced. Technically this is not a "settlement", because if you are holding an open Quarterlies contract when the weekly settlement occurs, your position will remain open, it will just experience a step-up in cost-basis and the unrealised Pnl is applied, so that socialised losses can be handled. BitMEX also has a weekly rebalancing for all their contracts, but currently their most popular product is the Daily 100x maximum leverage contract. This settles daily, but otherwise the rest of the contracts are handled on Friday, a little bit after OKCoin's 8:00AM UTC. See this website to get a countdown to the settlements on the different exchanges. The policies of exchanges are changing often so this information may be outdated by the time you read it (though we will try to keep it as up to date as possible). Dailies, Weeklies, BiWeeklies, Quarterlies -- What Should You Trade? Lots of different contracts to choose from. It can often be confusing to traders who are using multiple futures exchanges with different contract types -- inverse and qunato, dailies or quarterlies, 5x or 100x -- so people wonder: what should I trade? Well, it depends on what your goals are. If you are trying to do a little hedge for a medium term, you would want to use a quarterlies expiration contract instead, because otherwise you'd have to reopen shorter-term contracts after they expire and settle. If you want to do scalping, then shorter-term expiree contracts that settle really soon would be fine. Keep in mind, the normal state of futures markets is "contango", which means that longer dated contracts will have a premium to the current spot rate, to reflect the interest rate differential and time preference. This means you will see Weeklies maybe with a $1-2 preium and Quarterlies (assuming they expire months from now) with a $5-8 premium. As an example we have Quarterlies contracts right now at OKCoin that settle on December 25. So we're just starting December now, that means that even though these are "Quarterlies" contracts by classification, they are expiring not 3 months from now, but 1 month from now. Don't mix up the settlement expiration date with the naming convention. BitMEX and CryptoFacilities have a more professional and properly set up exchange that has a naming convention that makes sense and matches their settlement, while using weekly rebalancing to allow for profit takeouts of customers. So be aware of the premium or discount that is on longer dated contracts, this can allow you some arbitrage opportunities if you are patient and have the coins to apply to it. In general, we recommend that you trade any contract that has good liquidity and high volume. This is the most important characteristic of ANY product for a trader. If you can't get in and out reliably, and have a price that reasonably follows the spot market behavior, then it's not worth trading. They're the dark side of counterparty leverage in Bitcoin Futures trading. Socialised losses are the way that some bitcoin futures exchanges (BitMEX used to have this and called them "Dynamic Profit Equalisation" or DPE) and OKCoin/Deribit handle unfilled margin call liquidations. Note: BitMEX as of late 2016 now uses Auto Deleveraging (ADL) system. Coinpit and CryptoFacilities use a termination system too, which makes funds available right away so you don't have to wait for a contract period to clear. Because traders are using 20x, or up to 100x margin, sometimes the market moves so fast in one direction that they get margin-called and the system that sells their position is unable to get filled. This leads to a loss for the system, which is distributed to all the profitable traders at settlement/expiration of the specific contract. To illustrate the point, recall that futures markets are just counterparty contracts. Let's say I want to SHORT the market and profit off a decline in BTC/USD. If I put an order to sell Weekly futures contract at $400, and someone buys that offer, then we have created a futures contract. If it goes down, I profit and he loses, if it goes up, he profits and I lose. However, what if price goes down really fast, and my counterparty only had a little margin backing his position? Well, he gets margin-called when it goes down enough, and the system takes his contract and forces it to be sold to a different counterparty that wants to take the LONG side of my contract. Now, if that margin-call does not get filled and the price continues to fall, then I'm making profits on my contract but nobody is paying for it since the counterparty who got margin-called didn't get the liquidation order filled. So what happens is that at settlement time of the contract, that unfilled liquidation loss to the system will be deducted from the profits of ALL traders before they are distributed. This may sound like an unfair system to those who are used to trading with confidence that their profits are settled in full, but it's a compromise that has been made in order to offer the high leverage. If you want to guarantee that your profits are not reduced by any socialised loss, then use CryptoFacilities or Coinpit. They use a "termination" procedure in the event of a margin call not being filled. This simply terminates the contract and sends the portfolio value of the losing counterparty to the winning counterparty. It's worth noting that the system has been incredibly robust, with very minimal socialised losses being triggered on OKCoin and none on BitMEX as of November 2015. Connect with fellow bitcoin traders. Introduce yourself, be humble, and be ready to learn. Or you can just lurk and absorb the information around you. It can be a rough ride in the start, and you're bound to hit a loss or two, but after a lot of studying and execution you can develop profitable strategies.